6-9pm. Free. 21+. Full band. 10:30-close. Free. 21+. Full Band. 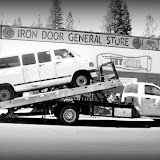 The Van broke down in Groveland on Saturday just when we were gonna head to Yosemite. And every mechanic was closed for a 60 mile radius. And even that one couldn't get the part until Monday. (1st they got the wrong part. Then the right part hours later.) We went kinda stir crazy in that small town for a couple days. Made it home on Monday. about 30 hours behind schedule. But she's back up and running now. And ready for the weekend. Let's get it on.